When beer from the iconic US brewery Stone started being distributed in Australia legitimately for the first time in 2015, their then brewmaster Mitch Steele followed the freight Down Under to see for himself how the beers were travelling. And, while here, he helped brew something new. 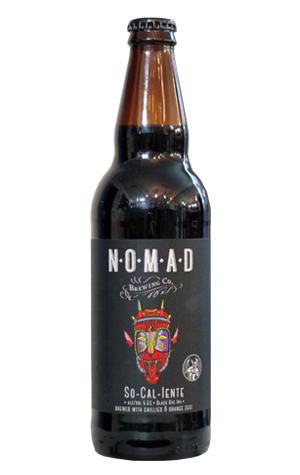 It was a collaboration with the Nomad brewery (which shares some ownership with the distributor Experienceit that brings in Stone’s beers) and ended up as a rye IPA named AirRyeEvil. Fast forward a year or so and, having been lured Down Under for Good Beer Week 2016, Stone co-founder Steve Wagner was also invited to the Brookvale brewery to team up with Nomad brewer Brooks Caretta on a follow-up. The resulting beer has been named So-Cal-Iente and it’s a continuation of the rye IPA idea, only this time in the form of a black rye IPA. However, true to Nomad style it’s been well bastardised, specifically with the addition of chilli and orange from the USA. The chilli is surprisingly subtle and in practice serves to be little more than a sprinkle on top of the peppery characters gained from the rye. The orange is subtle, too – if you’re expecting a straight-up glass of OJ your mind’s set on the wrong part of the fruit. It’s the zest of orange that’s key here, adding a slight citrus sharpness to the otherwise mainly tropical fruit characters imparted by the New Zealand hops. At just 5.5 percent ABV, So-Cal-Iente is at the lower end of the black IPA spectrum so don’t pop the top believing you’re in for a hard and fast palate-shredding experience. This is much more of a slow burner which, incidentally, if you’re pulling straight out of the fridge you’d do well to let gain a couple of degrees before indulging because what at first might seem to be a sleek and to-the-point beer really rounds itself out, the standout roasted malt character easing into its work while a gentle astringency builds. So-Cal-Iente might not be a beer that carries the arrogance of more famous Stone beers, nor one that expresses unique ingredients as much some other Nomad beers, but if you’re in the mood for an interesting dark ale that’s not going to push your palate right over the edge, with one of these in your glass you’ll be sitting pretty.